Pope Francis encouraged mothers to breastfeed in the Sistine chapel today - before baptising the baby of a couple who married in a civil service (something not previously done). The pope baptised 32 babies in the sacred Catholic chapel, telling mothers they should not be embarrassed to feed their hungry children there. 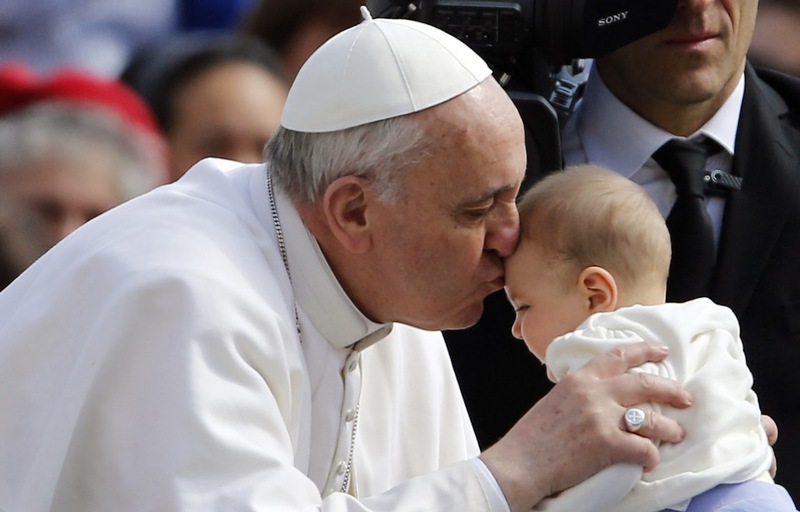 In an apparent first in the Vatican, he baptized seven-month-old Giulia Scardia, even though his parents married in a town hall. Such a civil service is not technically recognized by the Catholic Church. But the pope has said several times since his election that the Church must not make children of couples in "irregular situations feel like second-class faithful." Unlike his predecessors, who usually delivered long homilies at the yearly baptism event, the pope offered a brief one of 300 words, centred on the children. "Today the choir will sing, but the most beautiful choir of all is the choir of the infants who will make a noise." He continued in a relaxed manner addressing parents, "Some will cry because they are not comfortable, or because they are hungry. If they are hungry, mothers, feed them, without thinking twice. Because they are the most important people here." His words were delivered in the same room as the one in which he was elected on March 13th as the first non-European pope in 1,300 years. Michelangelo's frescoes in the Sistine Chapel are some of the world's most celebrated works of art. The ceiling depicts the creation of man and the altar wall shows a severe God at the Last Judgement. But the pope told mothers to not feel intimidated by the surrounding, echoing an interview he gave last month in which he said mothers should never feel uncomfortable breastfeeding during his services and ceremonies. Well, hopefully with that endorsement things will improve for the kids who benefit from the best form of nutrition there is.